Acolyte Morag is the assistant of Shaman Chirah, and has assisted his research for decades. When you first arrive in Stillrise Village she is found lying on the floor of the storage hut where Gorag is being held captive. She is apparently dead, having been bested by the Worm Cult. However after Chieftain Suhlak reveals the villagers' secret, a now skeletal Morag can be found having fully recovered from her apparently fatal wounds, a benefit of the village's curse. Shaman Chirah later directs you to her during your quest to recover the Soul Gem Array from the Worm Cult. Morag is easily able to discern the location, having tied one of her toe bones to the array several years earlier. "Shaman Chirah told me to expect you, but …. Wait, something's off. Beyond your flesh and blood, I mean. Z'en's blessings! The curse upon you is temporary. You can safely recover the soul gem array!" Are you certain I won't be a skeleton forever? "I'm positive. Shaman Chirah and I studied the curse for decades. 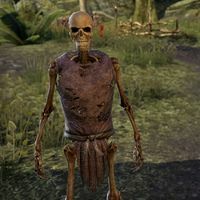 This is Clavicus Vile's way of being playful, I suppose … though I don't presume to know the intentions of any Daedric Prince." While I'm like this, am I invincible? "No. Despite what War Chief Helushk would tell you, sheer force can pummel us into the ground. Without Shaman Chirah's magic, my bones would still be in the pile where the Worm Cult left me. "Healing magic works. We often use magical fonts recovered from the temple, like the one next to me. The cultists took one last night, but Shaman Chirah has another. The rest are inside the temple. You're welcome to use them while you're still … underfed." Do you know where the Worm Cult took the soul gem array? "Lucky for us, I think ahead. Years ago I fastened one of my toe knuckles to the soul gem array. I can sense it's still in their nearby camp. After you give those moss-gargling cultists a good pounding, bring it straight to Chieftain Suhlak." I'll bring her the soul gem array when I recover it.